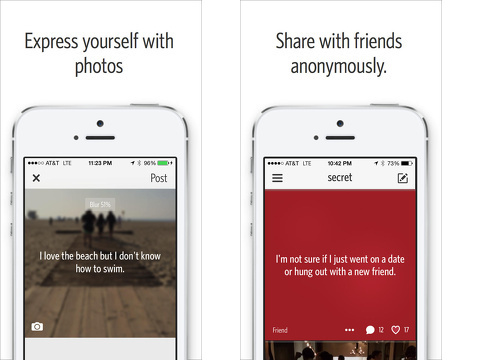 Share your secrets anonymously with the Secret – Speak Freely iPhone app. The slick social feed gives you glimpses of users’ and friends’ souls, hearts, and minds. The engagement tools are spare, yet effective. The freedom to express yourself without your name attached is refreshing. The free download from the iTunes App Store is exciting and exhilarating. The Secret iPhone app has a quick registration process. You enter your email and phone number. The phone number automatically connects you with your contacts within Secret’s social network, but everyone remains anonymous. You validate your phone number via SMS. The step-by-step process to create a secret is a pared-down version of Instagram. You may add a photo from your library or shoot one from the in-app camera. The only photo editing tool is blur. You swipe your finger gradually to the right until you achieve the desired effect. You add text and publish. You receive notifications when your secret receives likes and comments. Social iOS apps frequently throw every bell and whistle into the interface, but it can be distracting. You start to play around with all of the tools, and your focus on the content diminishes. In this case, the incorporation of a few, intuitive social networking tools emphasizes the secret. The emotional experience of being part of a secret is achieved with this subtle, balanced interface. 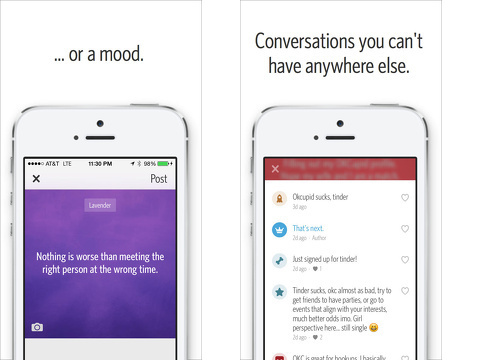 You feel happy, sad, compassionate, embarrassed, and excited in the Secret iPhone app. The idea of engaging socially, yet anonymously, is liberating, and the Secret iPhone app feeds off this need. Media touts the value of social engagement for brands. We constantly monitor our Facebook likes for our profile photo change and track the number of Twitter re-tweets for self-gratification. The Secret iPhone app, however, gives you the platform to share without the judgment of your friends or your mother’s lecture. It transforms your Facebook and Instagram over-sharing. You can put everything out there – without your name attached. AppSafari review of Secret – Speak Freely was written by Jenni Ward on February 20th, 2014 and categorized under App Store, Free, Fun, Social. Page viewed 5819 times, 1 so far today. Need help on using these apps? Please read the Help Page. Confessiondolls is an iPhone app for all your darkest secrets… Already two years on the Appstore. Much more fun.